A ClearOS Business Edition subscription is used to provide content, services and technical support for ClearOS. This simple configurator guides you through the setup process for a specific installation. Use the summary tool in the right hand navigation bar to track your changes. You can save up to 30% all ClearOS Business subscriptions and on most apps in the ClearCenter Marketplace by selecting a multi-term subscription. Thank you...your discount is being applied. Please be patient while we reload the page. Are you sure you want to reset the solution you're currently building and start again? 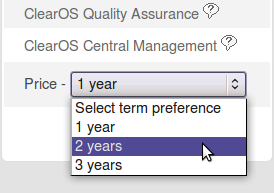 Please select a 1, 2 or 3 year subscription term from the dropdown menu before continuing with your selection. Select a multi-term subscription and save over 20%! Copyright © 2000-2017 ClearCenter, Corp.